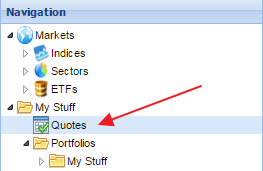 To view only quotes in the Table with no other dataset present, you can click the ‘Quotes’ header text, which is a hidden hyperlink, as shown below. Or, an equivalent action is to select the ‘Quotes’ line in the Navigation tree (panel below the Quotes Box), as below. 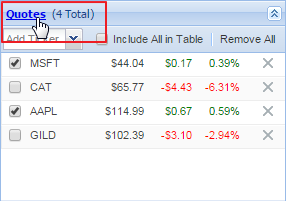 Either action will display only your selected quotes in the main Table. You can then use the Table to compare these tickers in any of your Table views.